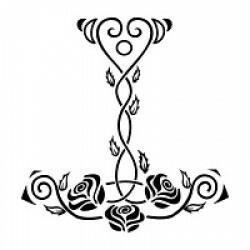 Not all those who wander are lost"
Check out Great Imaginations for this review!At the start of the book, Iron Hearted Violet had a lot of thing that seemed to promise a great story. Everything I was ready to see in a fantasy novel was combined into one book. 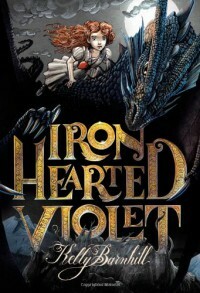 The book hit all the right notes, but the pacing, inaccurate illustrations and lack of consistency crippled the storyline from the start.Iron Hearted Violet raises an interesting point about the common misconception of royalty, especially princesses. Go to the Disney store, and you can see what issues face our little girls from a young age – a true princess is flawless. A true princess is beautiful. Something will be tossed in about bravery or a good heart, but a kind soul doesn't sell dolls. Beautiful hair and a fair complexion drives the money machine. I found it interesting that this issue cropped up when Disney decided to give the Brave heroine a complete makeover to drive Merida’s popularity in the marketplace. Fans revolt. I grew up with Barbie dolls, and Ariel was my inspiration when I was a small girl, but it was nice to see a princess hit the scenes that reflected a realistic look. I don’t want to veer off topic, but this very idea about the aesthetically pleasing princess played a center roll in the novel. Right away, I loved this blatant rebellion against plastic-looking female royal heirs. The entire voice of the book quickly drove the novel into a weirdly detached and whiny novel that never seemed to end. This book went on forever. I can handle a long book, but the inconsistent descriptions drove up the annoyance factor. The characters all seemed like their personalities were just made up as the author went along. I understand that the book was written from the point of view of the storyteller of the court, but the book would have stood a much better chance if it had taken on the voice of the main character. I am unsure if the author wished to make the book seem inconsistent to follow the realistic guidelines that fable-makers tend to assign feelings and actions to the people of their stories, but the results was a rambling emotional mess that really lost steam about mid-point. The world build was weak as well, and for a majority of the book, I felt a bit lost and struggled to keep up with the information and the people.The illustrator seemed miss the memo about Violet’s appearance, which rubbed me the wrong way. Princess Violet, in the book, was consistently described as unpleasant to the eye. The illustrations, however, depicted a sweet-looking girl. If you’re going to have the bravery to stand up to this hyped up description of pretty, pretty princesses, then have the courage to take a chance and draw the story accurately as well. It sent the wrong message and seemed to cancel out the moral of the story when the girl in the pictures failed to match the girl in the book. I wanted this book to be more, and it had a chance to be an outstanding novel. We need more authors telling girls that their worth is not equal to their appearances, and there is nothing wrong with looking different from the glossy and romantic images that are pushed on us from a young age. This novel, sad to say, was neutered from the start, and in the end, the book wimped out on an important message and deflated like a balloon after the party. Was it bad? No. Did I set my expectations high? Yes. Could have it been better? Hell yes.